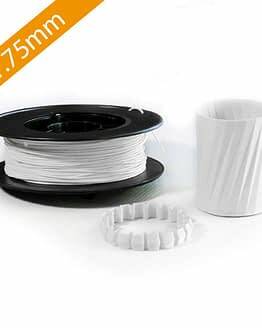 WillowFlex is a Flexible, Premium Eco-Filament made from compostable raw-materials. Makers can print ecological objects that don’t harm nature or the people in the printing area. 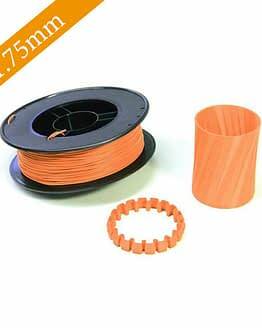 It is more heat and cold resistant then standard filaments at the same price. WillowFlex was successfully launched on Kickstarter (151% backed) with supporters from 32 countries worldwide. It is now available in our Online-Shop in 1,75mm and 2,85mm. Our production process puts our primary emphasis on quality. We work with experienced production partners to offer WillowFlex to the world! WillowFlex is extruded by 3d-k.berlin in the experimental hub of Berlin. 3dk produces filament for 3D Printing based on 30 years of professional experience in Plastic Production and Extrusion. All produced filament is tested on 7 different 3D Printers in their lab. Their primary emphasis is on an error-free and uninterrupted print experience – determined by the material quality and a well-calibrated machine. Our 3D print filament is spooled by Mosaik-WFB in Berlin Kreuzberg, a workshop that empowers disabled persons to work together in a independent and socially protected space. Why is WillowFlex a game-changer? 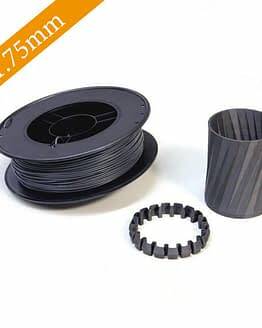 WillowFlex is the first flexible 3D print filament made from compostable raw materials. This unique elastomeric bioplastic is made from compostable raw materials that have passed the U.S. (ASTM D6400) and E.U. (EN 13432) standards for compostability. WillowFlex’s primary component material is non-GMO corn starch. Anyone who has tried 3D printing knows the familiar scent of melted plastic in the air. WillowFlex gives hardly any smell and significantly less micro-particles in the air. We envision WillowFlex will set a new baseline for filaments used in sensitive environments such as schools, homes and kitchen, and medical applications. What do the compostability standards actually mean? Disintegrability with test material greater >2 mm less than 10% of the original mass. Absence of negative effects on the composting process. The raw material from WillowFlex has also met the less stringent U.S. compostability standards ASTM D6400. Can I compost WillowFlex myself? stays The compostability tests were completed in a controlled, industrial composting environment. But we have also put WillowFlex parts in a standard, backyard composting environment and they also breakdown in 2-3 years. In order to speed up the process, like with any good composting, the parts should ideally be shredded first to enable the anaerobic process. Also make sure that the composting is providing all 4 ingredients for healthy composting. The Composition Process only occurs when 4 criteria appear concurrently – Moisture, Microbes, Oxygen and Heat. When any one of these criteria are not met, then the material will remain stable. We like to compare it with wood; when it stays dry, clean, out of direct sun – it can last for generations. When wood however stays moist, dark, warm outdoors, it may not even last a year. Illustration of the Four Ingredients of Composting; Moisture, Microbes, Heat and Oxygen. What are the unique features of WillowFlex? Works with every printer on the market that we have tested so far! What is your long-term vision for WillowFlex? WillowFlex offers high-quality material that is moving us towards a decentralized, plant based elastomer that outperforms many of it’s oil-based competitors. But there is still room for improvement. We want to see WillowFlex produced locally from regional plant matter that can be returned to the soil when done. And we want to experiment with other starch sources than corn that are less intensive for the soil. This will have the added benefit of providing different material qualities such as faster decomposition time, different material qualities, etc. Our immediate goal is to raise the production quantity of WillowFlex to justify opening a second production center here in Europe. Where can I order WillowFlex? WillowFlex can be ordered directly from our Online-Store. We will ship within 2 days of receiving payment. 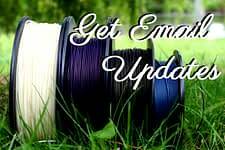 If you are ordering 15+ spools or are interested in larger spools then those shown online, please contact us directly at order@willow-flex.com. I would like to buy bigger quantities, do you offer a discount? Yes! We provide individual offers for WillowFlex-customers who need larger quantities. The first discounts come at 12 spools. And we can prepare larger spools 1-10kgs which are also available at a discounted rate per kilo. Yes – we ship around the world. You will need to pay for your own shipping and insurance, but we will ship to you! We are also increasingly getting resellers that can sell to you in your own country. We also expect to open a US delivery point in the nearer future. Will WillowFlex work with my printer? We have a print guide that will give you starting point for WillowFlex settings for both FDM and Bowden Extruder printers. It has worked with all printers that we have tested so far. It works on an unheated bed, so that lowers the access level significantly. We are happy to work with any machine manufacturers to determine the ideal settings for producing good parts with WillowFlex. Does WillowFlex require a heated bed? No, WillowFlex doesn’t need a heated bed to print. You can print directly onto print tape, glue, etc. We have found that in general WillowFlex is very forgiving as long as you have a good adhesion of the first layer. We always recommend to start with our print settings recommendations. Can WillowFlex be used with support material? Yes. We have printed with WillowFlex as the supporting material and also with other 3rd party support materials. Both printed without problem, although because WillowFlex has such strong adhesive properties, the support material is not as easy to remove as with other filament types, especially when it is supported with WillowFlex. What is the finish of WillowFlex? Can it be improved? As a natural material and elastomer, WillowFlex tends to have a very smooth, matte finish. It has good bonding properties and so can also relatively easily be made watertight. One of the tricks we use on occasion it to heat the entire print (or place it briefly in boiling water) and then remove it quickly after to provide a slight softening and hardening of the plastic to create a better bond between layers. When WillowFlex is treatied with Acetone, it swells/expands and forms bubbles between the print outlines (outer shell swells, inner shell doesn’t) and ruins the nice outside finish of the print. Why does my WillowFlex feel sticky? When WillowFlex becomes too hot at some point of the processing, then the surface may become “sticky”. It can still be used in processing and when it is melted again while printing, it will not affect the final print quality. WillowFlex bonds very well with PLA. On our youtube channel you can find a printed example of a WillowFlex/ PLA-Hinge. We haven’t done as many tests with ABS, but it appears to react similarly.